The SAP CRM module from the SAP Business ByDesign suite allows users to focus on important tasks with ease and efficiency. The collaboration window provides quick access to frequently used functions and Microsoft Office applications. One-click access to a variety of reports and everyday tasks fosters efficiency and enhanced productivity. Role-specific widgets provide quick access to email, calendars, task lists, data, and maps. 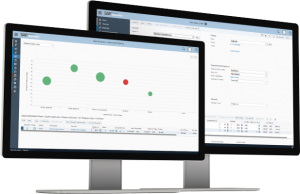 Learn about the newest SAP CRM features within SAP Business ByDesign. SAP CRM takes a wholly customer centric view of your business systems, allowing you to provide a fantastic customer experience, while linking up the front and back end of your business. Seamless integration with other SAP modules means your SAP CRM will communicate (in real-time) with any other necessary applications, which means you have total visibility over your business operations. The CRM module in SAP Business ByDesign ERP solution offers the following features and benefits to help manufacturing and distribution businesses manage marketing, sales, and service.